The Hamilton Watch Co., America's most iconic vintage watch firm, built treasured timepieces that are still cherished by many today. 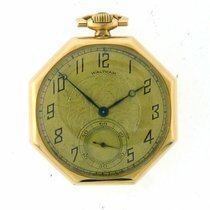 During their peak years, which lasted from the 30's into the 60's, the Pennsylvania establishment developed a reputation for innovation and quality, creating some of the finest wristwatches in America. Today's offering showcases this fabulous Art Deco style men Hamilton suggestive of the glittering elegance associated with 1930's and 40's American high society. 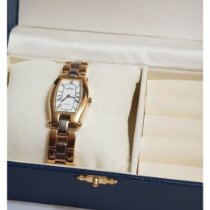 It features an elegant "knot lug" case, one of our favourite vintage dress watch designs from the era, a beautiful diamond Art Deco dial (face), and a fine Hamilton movement. Its knotted-lug design case, which shares a similar design with a Jaeger-LeCoultre model and a Longines model from the same period, both produced by American case manufacturers, is in excellent condition. Its striking two tone diamond dial is also in excellent condition and is a vintage restoration. Its finely crafted and decorated Hamilton movement, compares favourably with other mechanisms of the era, is keeping very accurate time. One of our watchmakers has freshly disassembled the watch down to the last screw and cleaned and oiled it, and installed a brand new correct new-old-stock mineral glass crystal. For the finishing touch we have equipped it with a brand new Teju lizard strap making it ready for immediate enjoyment. Dial: Silver, two-tone, signed Hamilton, white gold and diamond Art Deco Arabic and solitaire indicates, nicely restored in vintage times, excellent condition with very slight aging. Please inquire if you would like a fresh restoration. Hands: Original, white gold "lances"
Serviced: One of our watchmakers has freshly disassembled the watch down to the last screw and cleaned and oiled it, and installed a brand new correct new-old-stock mineral glass crystal. Warranty: 1-year international warranty. Please message us for details.